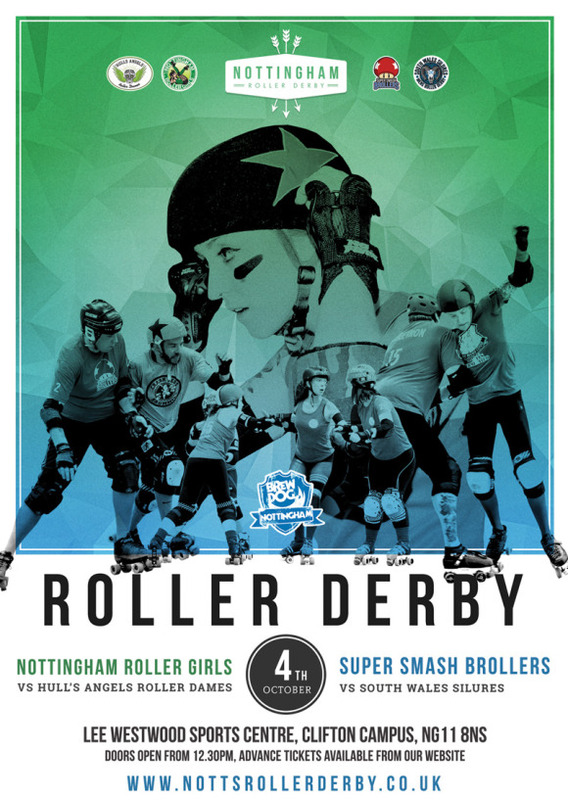 On October 4th, Nottingham Roller Derby will proudly host the Hull’s Angels Roller Dames, and the South Wales Silures, at the Lee Westwood Sports centre for an explosive Autumn double-header! Following consecutive record-winning margins, the Super Smash Brollers are on fine form but arguably face their strongest opponents yet this year. Cardiff’s Silures boys will be on a sporting high after taking second place in the inaugural Men’s European Roller Derby Cup, where they demonstrated a new level of tactical maturity to match their trademark physicality. Can Langlois’ ever-improving Brollers push themselves to new heights? Or will rollCall, Cronick and the SWS wrecking machine continue their charge up the UK rankings? Back in August, NRG regained their winning streak with a convincing Heartland Series victory over Northampton’s Vendetta Vixens – but must now take on the notorious HARD-hitting girls from Humberside. The Angels achieved mixed results in 2014, taking four wins from eight games, gaining strong point credentials against Haunted City and the Shoetown Slayers. Having recorded eight wins out of their last ten games, Nottingham will need to ‘bring-it’ all on track to defeat the laudable Angels, who are currently ranked eighteen places above NRG in Europe. It’s set to be an exciting double-header, folks! Come along and witness the all the rip-roaring fun! After party: We will be heading to the city centre to our favourite watering hole (home of our sponsors) Brew Dog Bar Nottingham. Have a look at the Facebook event page.